Very sad about what happened to the Jewish population so many of the synagogues during Nazi Germany. Kaiserslautern's memorial is amazing. I love the 3d pictures. 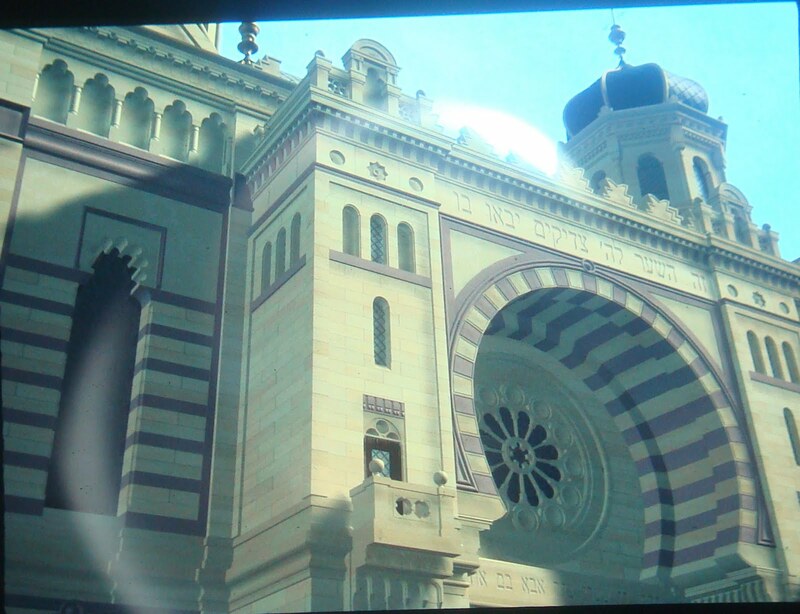 Also, the black and white picture shows how amazing this synagogue used to be. Glad to hear it is being remembered though. what a beautiful building it used to be what a complete tragedy for the jewish people they deserve to be remembered especially in the places they suffered most. The history of the destruction of the Synagogue is not correct as given here. 10 Nov. 1938 was Kristallnacht, and that is when the synagogue was destroyed along with the majority of homes and apartments where Kaiserslautern Jews lived. Men were sent off to their deaths, and families followed. The memorial has a list of murdered Jews from the city. Hardly anyone I know in the city seems to know much about this monument. I speak German and I asked others about it Many were ignorant of it. It is a small town and next to the largest bank in town. Your depiction is actually quite disturbing more than historically accurate. You write: "At that time Kaiserslautern was slated to become a center of Nazi influence in the Palatinate part of Germany. Having a prominent Jewish synagogue in the city did not help the city’s desires to attract Nazi favor so the city elders decided a closer adherence to a local architectural code and a need for a parade field meant that the synagogue must come down. The last service at the Kaiserslautern synagogue was on 27 August and the demolition of the building began a few days later on 31 August 1938." The demolition happen at the same time and was a surprise attack on the Jewish civilian population. A German man came back to say he was sorry, according to a Nov 2013 Newspaper account. He told the mother of two who stood there in their destroyed home, "I am so sorry. You husband was a good doctor and he saved my daughter's life. But I did not want to lose my job, and I was ordered to destroy your house." Kaiserslautern had terrible blood on their hands. It wasn't "the Nazis" but the complacency of the German people at that time that allowed this to happen. America-- and it seems all humanity--has these lapses, and we do not seem to learn the great depravity that humankind is capable of. Instead we say, "Remember!" and "never again." The synagogue was and still is the most beautiful building ever in Kaiserslautern since Roman times, and you said "a closer adherence to a local architectural code and a need for a parade field meant that the synagogue must come down." It seems as if you were voting on the council yourselves to justify this very ugly human tragedy. 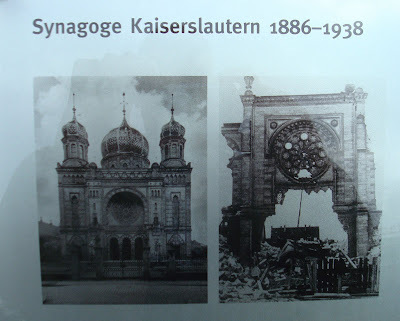 This is incorrect, according to documentation in Kaiserslautern, "The Nazis destroyed the synagogue in the late summer of 1938, even before Kristallnacht took place." You are correct DiAnna on your comment to Tango Therapist above and thank you. 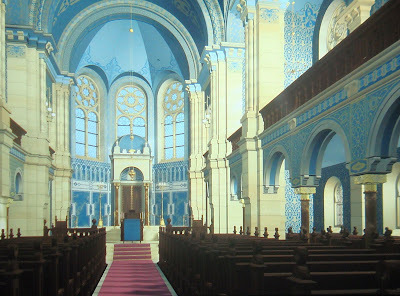 This is what I stated in the blog "The last service at the Kaiserslautern synagogue was on 27 August and the demolition of the building began a few days later on 31 August 1938. This occurred just a few months before Kristallnacht (Crystal Night)"
If you did some research on the Kaiserslautern Synagogue you will find that my facts are correct. 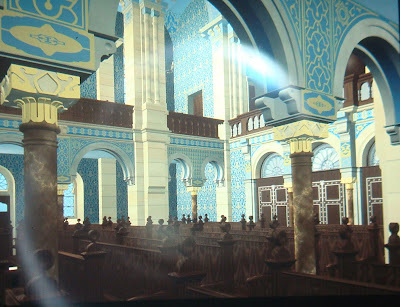 The Kaiserslautern Synagogue was not destroyed on Kristallnacht. It had already been torn down by then for the very reasons I stated; the desire of local powers to attract and gain Nazi influence. 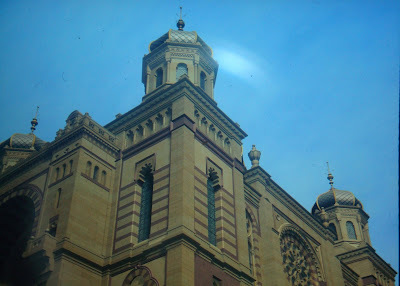 The comment a "closer adherence to a local architectural code and a need for a parade field meant that the synagogue must come down" are not my thoughts or my view. That comment is based, again, on the research that I did and was the excuse and ruse that the city fathers gave and their justification for tearing down the synagogue. Your final sentence is actually quite insulting, insinuating that I condone the actions of the Kaiserslautern people who orchestrated this tragedy. My family Herze attended here after moving from Essweiler in 1902, On October 20th, 1940 all 7 in the family were deported and eventually killed in the Holocaust....a stumbling stone memorial was placed at the last address where they were free in June 2014. I am glad to see photo of where they once worshiped.